Post subject: some sort of Cambs area road ride? anyone fancy some sort of autumnal road ride around my gaff? Very quiet B roads, flat, undulating at most. Post subject: Re: some sort of Cambs area road ride? I'd be interested, pending permission. anyone got a saturday in mind? Count me in if it doesn't clash with anything else. Definitely can't do 8/15 Nov though. ok - am away next weekend so come on peeps, throw some dates at me, not the usual rotten fruit though. Hi, my name is andy and i could be up for this although 6 miles and then a pub stop does sound more appealling. 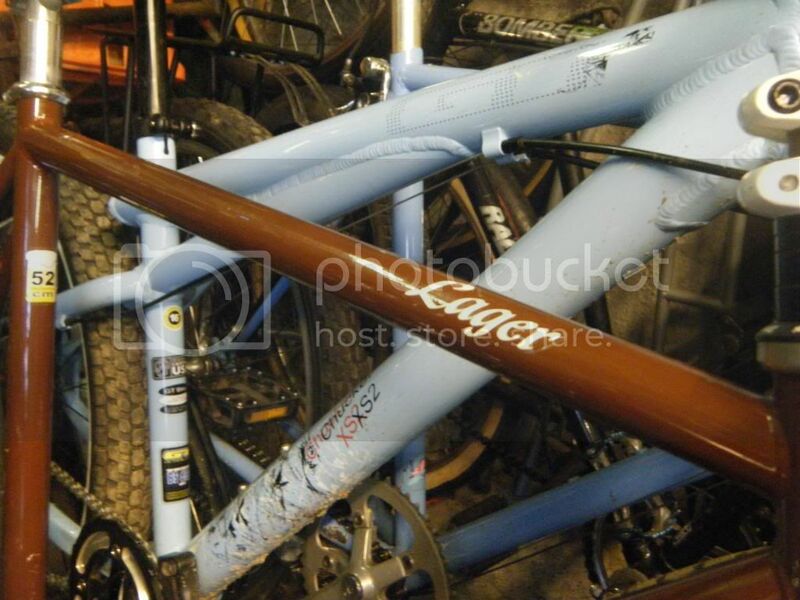 I have just joined the forum and have a garage full of what most people call rusty crappy old bikes..... Fair point at times. I hope to catch up with a few locals at some point. Looking more and more like a January Freezer ride then. January is good with me. Bumping would probably work better if the thread wasn't already sticky. You're all very welcome to hop on trains north and join http://www.KLWNBUG.co.uk easy riders from Lynnsport at 10am on Sunday (or the South Quay at 7pm Thu but you'd spend more time on the train than riding!). It's not retro specific but vintage steel usually gets some admiration. It's been a while since we've seen some (mine is in bits being rustproofed and repainted) but I still remember a lovely Holdsworth a while back. New bicycle arrived just for days like these. Lets wait for the snow/ ice to clear a bit before we go out into the wilds of Northamptonshire and Cambridgeshire. Will change the ride to a 'February Freezer'? Wicked pub half way round. Hi LGF. Could be interested, been wanting to do a retro road ride for quite a while now. Got a really nice neon yellow splatter paint '91 Trek that'd be just perfect for it. When are you thinking, Mark? For once, I'll be in Huntingdon next weekend, so 7th or 8th would be a possibility for me. Bit busy next weekend, have to work Saturday morning and am busy Sunday. That said, if you decide to head out on the Saturday and ride Kings Cliffe way I'd like to meet up for a few miles. May do the Saturday then. Have three bikes to chose from now. The forecast looks...not that bad. Unless it really turns nasty, I'll head for the East Northants area on Saturday afternoon. It's a lot flatter than Rutland, which is where I end up if I head the other way out of Corby. Suits the winter 'fitness' level better. Sorry, guys...Saturday meeting with the estate agent, so I'm out. Oki dokes - another weekend maybe. No probs. Will keep an eye on the Anglian area group. Would rather wait for better conditions to ride the retro Trek in anyway. Any dates sorted for this? While you wait, come join the Reach Ride, Monday 4 May, 9am Cambridge Guildhall, 10am Newmarket Road Park+Ride? I'm down this end that weekend for a change. Only got a modern road bike here now, but I' d love to get out on it. where from and how far? The sunny pleasant local of Alconbury. PM me for details. Still have this mind, 6 months on...!